I created this dessert as the finale for a delectable Indian feast prepared by a good friend of ours from the sub-continent. The cool, refreshing taste of citrus made a fine counter point to the spicy dishes of the evening. Since then, I’ve served these oranges as a light dessert after a spread of tapas and as the sweet conclusion to a winter chili supper. With a sharp knife, preferably a chef’s knife, cut a thick slice from each end of an orange. Stand the orange upright on a cutting board, and starting at the top, slice downwards following the contour of the fruit, cutting away all of the skin and all of the white pith beneath. Repeat with the other oranges. Slice the peeled oranges into 1/4-inch thick rounds. Remove and discard any seeds. Arrange the orange slices slightly overlapping in a shallow nonreactive dish. Place the red wine, sugar, orange zest, cloves, cardamom, and cinnamon stick halves in a medium, heavy saucepan set over medium high heat. Stir to mix and bring mixture to a robust simmer. Cook until mixture has reduced to 3/4 cup and is slightly thickened, about 7 to 8 minutes. Watch carefully as cooking time can vary. Strain the mixture. Then pour half of it over the orange slices. Marinate, uncovered, at least an hour, preferably 2 to 3 hours at room temperature. To serve, reheat the remaining wine mixture just until warm. Arrange a fourth of the orange slices in an overlapping circle on each of 4 dessert plates. 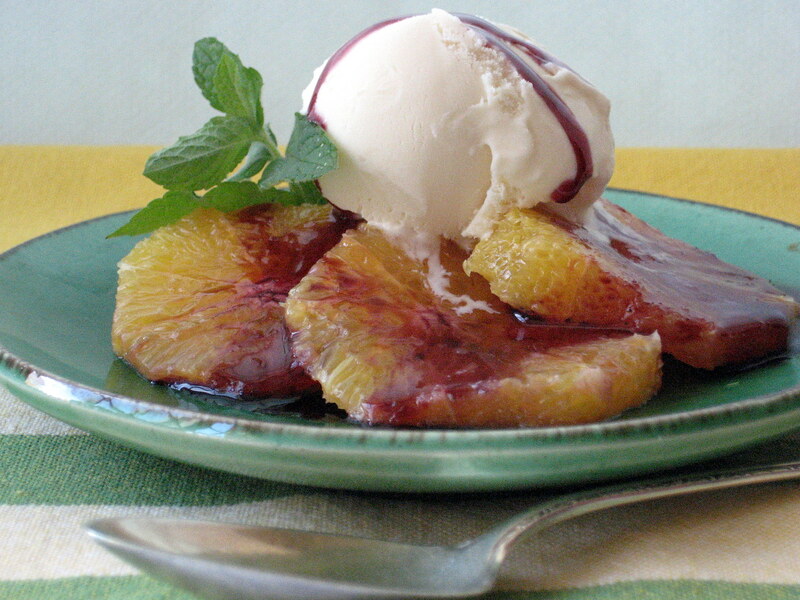 Garnish the center of each with a small scoop of vanilla ice cream. Drizzle some of the remaining sauce over the ice cream and garnish each serving with a mint sprig. Serves 4. This entry was posted in 2010 Recipes, Desserts, Recipe Pantry and tagged ice cream, oranges, spices by brosbottom. Bookmark the permalink.